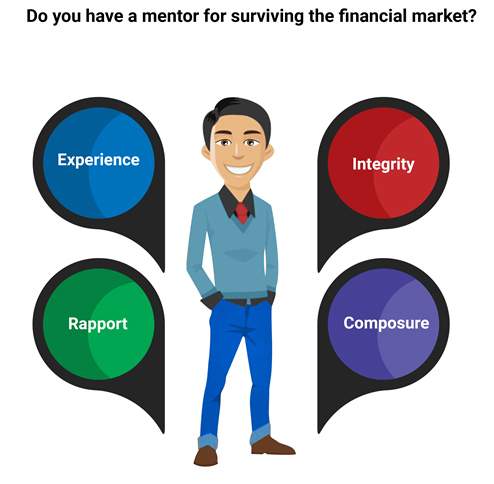 Do you have a mentor for surviving in the financial market? The stock market can be a tricky matter for a newbie and the inexperienced. You take a risk with your hard-earned money, and if you lose it, there is no way to get it back. The stock market can be a tricky matter for a newbie and the inexperienced. You take a risk with your hard-earned money, and if you lose it, there is no way to get it back. There are many sources of information that guide you on the do's and don'ts. However, there is too much information these days, and things can get confusing. Therefore, it is essential to know what the right information is and how to use it. It is vital to understand what action will generate the desired result. It is a widely acknowledged fact that experience is the best teacher. The second best teacher is someone who has it. You must be prepared to listen to an experienced person. It is essential to find the right person with the knowledge you wish to learn. Your mentor should be a person of integrity. He/she should not only be honest with you, but also have sound knowledge, complete experience, and be well-versed with trading and stock analysis. He should give you the right information and should not lie about his expertise or experience. It is important that you share a healthy rapport with your mentor. Though it is a formal relationship, you should be able to connect with your mentor on many levels. A similar educational background and exposure will also help you understand him/her quickly and the learning experience would become easier. Your mentor should be able to handle stress and difficult situations. This trait is important, especially for a trader, because there are numerous occasions which can cause stress. If your mentor can handle tough situations calmly and maintain his composure; this will inspire you to have the same traits. Experience gained over a period also gives adept professionals a strong sense of intuition. Your mentor needs to have the sixth sense which instinctively helps him know what his next move should be. Sometimes, one needs to take decisions that do now follow the set routine and norms. Your mentor should possess this innate ability to know about stocks and market trends. After spending time with him, you can pick up on those tactics and thought patterns. This will help you develop your own intuition towards events happening in the stock market. In difficult times and situations, you can always reach out to your mentor and seek his assistance even after your mentorship is over. There can be instances where you can work in partnership with your mentor to beat a bullish run in the stock market. Having a mentor is also an assurance of going in the right direction and not fighting a battle alone.